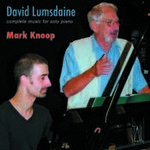 Ruhe sanfte, sanfte ruh' : for piano solo / David Lumsdaine. Dedication note: Dedicated to the memory of Jannice Porter. Program note: David Lumsdaine's "Ruhe sanft"
Analysis of David Lumsdaine's "Ruhe sanfte, sanfte ruh'"
Article: Identity and memory: temporality in the music of David Lumsdaine / Andrew Schultz. Article: Creating a musical Mandala / Andrew Ford. Unknown date: featuring Ron Lumsden.